Naval Battle Game Comes Alive! It has been an amazing year so far full of a lot of progress on our latest naval battle game Letters of Marque. It went from merely a concept in June to something that can be played, in less than 6 months. We want to thank all of our fans that have been keeping us motivated. Your feedback is greatly appreciated, keep it up! Your follows, likes, and comments are great for getting us moving on the development to make you a great age of sail ship action game! At the start we laid out our goals (to make a fun naval battle game) and began the work using placeholders and quick script segments to approximate the game. A quick Finite State Logic helmed the AI ships and a placeholder brig took the place of a more detailed model. Gun a blazing we got into games and had a lot of fun, cementing our decision to continue the project and develop the gameplay in the same style as planned. 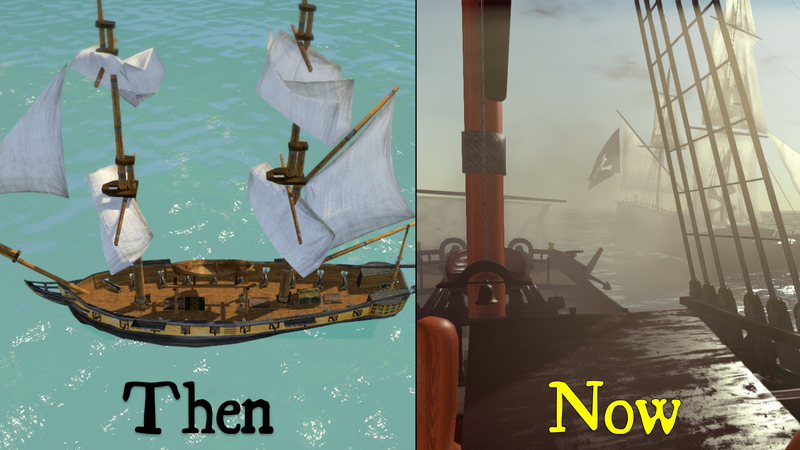 When work first started on LoM we had no real naval assets and we asked to borrow a brig model from another game to use temporarily. We were granted the use of the placeholder model from the generous folks over atPiratesAhoy! and the real work could begin. With just Jehremie (aka Captain Murphy) and Justin (aka Trunks) on the team at the time it was a daunting task for sure; but soon after work began, Christian (aka Flannery) contacted us and offered his skills as a composer! He was taken on immediately and started on the intro and battle music. As some time passed we went through many changes and iterations of assets, which will be explained in the following sections, our first real model was created by Christian a few months later, (Gole Ketch) which is the ship you see in our screen shots. In the past 6 months that Wolf Pack Games has worked on the naval battle game Letters of Marque and Reprisal (LoM), the company has faced a few obstacles to development. Our composer/modeler/artist Christian recently had a newborn baby (CONGRATS!) and with that some assets had to be delayed and pushed back, such as new ship models, sounds, and various art assets for the website. Christian also helmed the music for the popular game Life is Feudal, which will have the soundtrack available to purchase before long. We also had another team member go through a career change and is still trying to get back on his feet after the switch. We have had a lot happen over the past year but progress has not stopped. Through thick and thin we managed to knock out around 30% of the game, mostly mechanics and core components that were hammered out after hours from our regular jobs and other obligations. With any project, there will always be trials and tribulations when trying to find what does and (mostly) does not work. 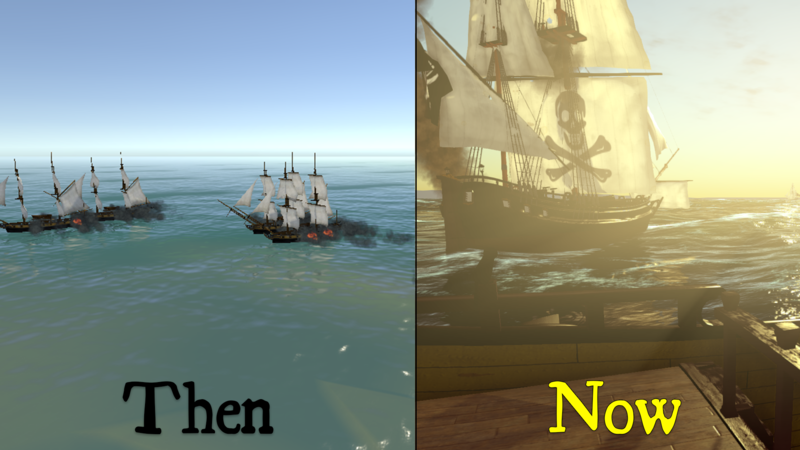 It was no less an effort with this naval battle game over the past few months as we tested multiple water shaders, sail/material shaders, and also core networking components. When the dust finally settled after weeks of testing and breaking components and assets, we finally settled on some great systems. The Sails/PBR shaders are UBER, the water is Ceto, and the networking is actually a homebrew solution created by the team over at Black Wake called WakeNet. We will get more in depth on that later as we are planning to actually open source that system for everyone to make use of. Although it set us back a couple weeks on our development plan, the near photo realistic quality results speak for themselves. As we rounded out the new year, we are in a great path for this naval battle game to continue on. We passed our 30% roadmap mark just before the new year and as our crew’s lives are slowly getting back in order we are building up momentum and the project is now a fully functional game that can be played for free! We recommend that you get into playing it now as we don’t know how long we will keep it free for download and play. Eventually it will go back to closed source where only the testers get the latest version. We won’t deprecate the existing copies, they are out there forever for everyone to try out. We have our naval battle game on social media at pretty much all of the major locations, Twitter, Facebook, Google+, Instagram, Reddit, and IndieDB and we always love it when fans take time to follow/like/upvote us on those pages. It means a lot that people are excited to see the naval battle game of their dreams get built! We also love to see random players hop into our testing games in the evenings. We mostly work on the game from 5-11pm CST so if you happen to see a game running then, it is probably us. Stop in and say hi and lob a few cannonballs at us! That wraps it for this summary report, look out for a devblog coming soon! So the last time we tested this game patcher out we kept getting some odd issues due to files either not being correct, or having new characters or formatting in them, so we pulled the patcher/launcher out of the test builds because we were losing far too much time to the bugs. We finally got a chance to take it apart and actually see what was happening, and it was actually fairly simple, but needed some extensive work to get it back to stable. As a result we added in a new feature at the same time to be able to download a full version of the game (or clear a previously installed version) so that you don’t have to download a zip file every time. The patcher itself shouldn’t need any updating for now, but a later edition will likely have the ability to patch itself as well as the game. Without further ado, here is the new patcher! Get into the action today with the latest update! Ship cannons have slightly lower max elevation. This gives a bit more control over the guns elevation. Ship syncing was redone to only need one RPC on client connect. Reducing overhead network load when a new player joins. Enter key now focuses on the chat more reliably. Also enter after sending message removes focus from the chat box. Controls page has been fixed for its spawning. Moved to a new method of control. Starting splash screen delay sort-of fixed. It loads smoother but still working on reducing the time some more. Players can only join servers that are the same version as them. Keeps crashes from occurring when someone tries to join an older/newer server. Masts do not sync their destroyed status on new player joins. The physics still respond the same but the new client would see full rigging regardless of damage state of the players rig. No collision damage when ships hit, just rigging. If you start with v0.2.15.1217a – 0.2.15.1217b then the Launcher application is broken in it. You can either download a new launcher (on the right) or download the full game again with the launcher included.